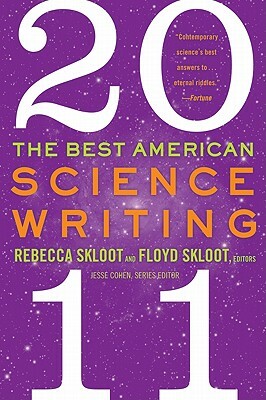 The 2011 edition of the popular annual series that Kirkus Reviews hailed as “superb brain candy,” Best American Science Writing 2011 continues the tradition of gathering the most crucial, thought-provoking and engaging science writing of the year together into one extraordinary volume. Edited by Rebecca Skloot, award-winning science writer, contributing editor for Popular Science magazine, and author of the New York Times bestseller, The Immortal Life of Henrietta Lacks, along with her father, Floyd Skloot, multiple award-winning non-fiction writer and poet, and past contributor to the series, Best American Science Writing 2011 sheds brilliant light on the most amazing and confounding scientific issues and achievements of our time. Rebecca Skloot is an award-winning science writer whose work has appeared in the New York Times Magazine and elsewhere. Her debut book, The Immortal Life of Henrietta Lacks, became an instant New York Times bestseller. It was chosen as a best book of 2010 by more than sixty major media outlets, and is being adapted into an HBO film by Oprah Winfrey and Alan Ball. Floyd Skloot is a writer of creative nonfiction, poetry, and fiction. He has received three Pushcart Prizes and a PEN USA Literary Award, among other honors. He is the author of seventeen books, and his work has appeared in the New York Times Magazine, Atlantic Monthly, Harper’s, and elsewhere. He lives in Portland, Oregon, with his wife, Beverly Hallberg. Jesse Cohen is a writer and freelance editor. He lives in New York City.